Now that the election’s over, it’s time for us contrarians to get greedy! And I’ve got just the thing: 3 hated buys we can use to rack up serious gains and dividends while the rest of the herd struggles to get its bearings. Where do these 3 cash machines come from? The defense and infrastructure sectors. Now you might see where I’m coming from on infrastructure. Probably the one thing Republicans and Democrats agree on is that our ramshackle roads, bridges and power plants need a lot of work. More on this, including a rock-solid play for 6.5% dividends and “steady as she goes” upside, at the end of this article. Before we get to that, though, let’s talk defense, a sector that might surprise you given that the media regularly rolls out stories about Democrats’ reluctance to goose the Pentagon budget. 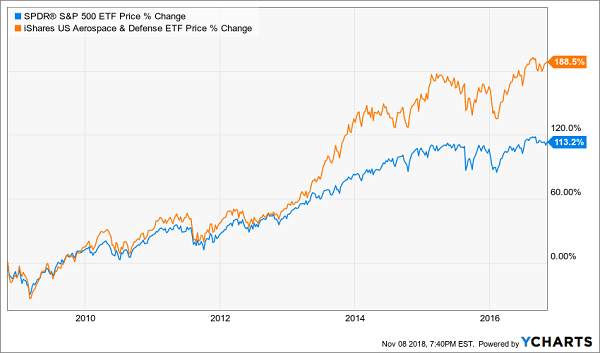 From this chart, you might be fooled into thinking defense stocks are too pricey now. And sure, some have gotten ahead of themselves. But the two I want to show you below are still bargains, giving us a rare second chance to jump in. If you’ve been watching the news (and who hasn’t? ), you may have seen President Trump call for a 5% spending cut across all departments. But even if defense gets lumped into that, as Barron’s recently pointed out, only 21% of the department’s budget goes to buying weapons, so procurement could be spared. In fact, I’ll go you one better: it will be spared. Because other countries (I’m looking at you, China) are always experimenting with new tech, like hypersonic weapons, and America will always have to respond. 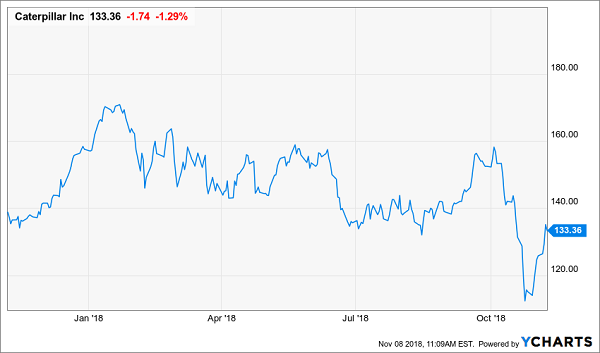 All of this is good news for Northrop Grumman (NOC) and Raytheon (RTN). This pair aren’t your typical arms merchants, churning out old-school tanks, trucks and planes for Uncle Sam and his friends. 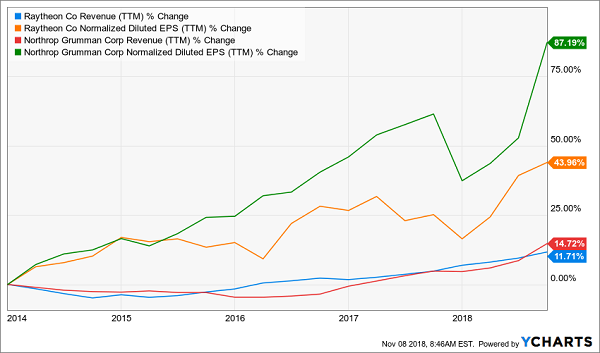 They’re basically tech stocks—but they’re actually cheaper than big tech names like, say, Alphabet (GOOGL), with each trading just below 16-times forward earnings. Why do I say they’re tech stocks? Take Northrop. Sure, it churns out military gear like the heavyweight A-10 Thunderbolt plane and the next-gen B-21 bomber. But it also stakes a big part of its business on things like drones for military and research purposes, space-launch systems and cybersecurity. You may be wondering why I’m excited about 2 stocks with puny current yields around 1.7%. 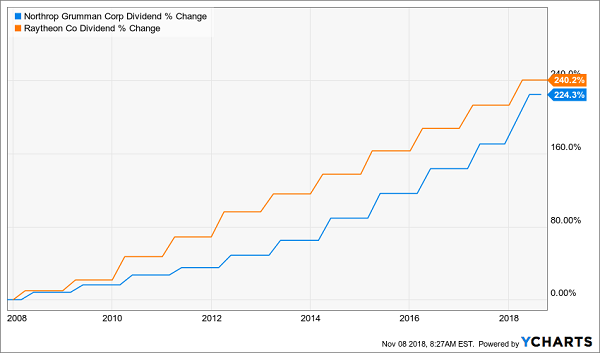 But as I’ve written before, if you’re investing for the long haul, it’s dividend growth that matters—as a surging payout is a critical share-price driver. And these 2 sport dividend histories that would make your typical holder of, say, the SPDR S&P 500 ETF (SPY) green with envy! Thanks to this massive growth, if you’d bought Northrop 10 years ago, you’d be yielding a fat 12% on your initial buy today. Raytheon? A tidy 7.3%. We can expect plenty more, even if defense spending flattens out for a bit. Northrop pays out just 39% of free cash flow (FCF) and 29% of earnings as dividends, with both well below my “safe zone” of around 50%. Raytheon’s payout growth is also locked in, at 53% of FCF and 39% of earnings. Your next move? Grab these two “undercover” tech stocks now, before their prices race away. When it comes to infrastructure, the one thing we don’t want to do is stake our nest egg on the popular names, because these stocks are some of the wildest you’ll find. Take Caterpillar (CAT), which may indeed benefit if Trump and the Democrats, er, hammer out an infrastructure plan. Trouble is, CAT boasts a 5-year “beta” of 1.6, meaning it’s 60% more volatile than the market! Keep in mind that a stock with a beta of 1 largely moves in time with the market. Anything above is more volatile, below, less. (NOC and RTN, for their part, sport betas of 0.83 and 0.84, respectively). CAT buyers are taking on a lot of price heartburn for a measly 2.5% dividend! 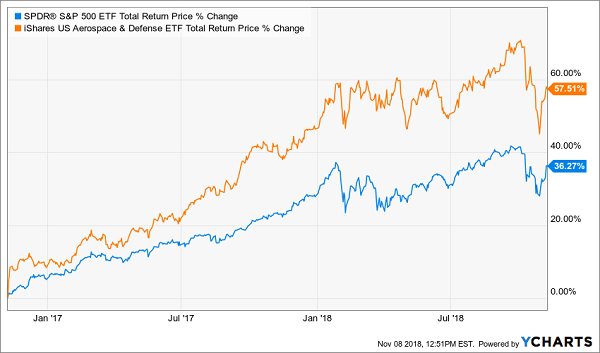 Which brings me to the Reaves Utility Income Fund (UTG), a more conservative, less volatile (beta: 0.45) and diversified way to invest in infrastructure. The CEF focuses on traditional utilities and telecoms, with almost all of its portfolio in the US, though you do get some exposure to top-notch international companies, as well, such as dominant Canadian telco BCE Inc. (BCE). 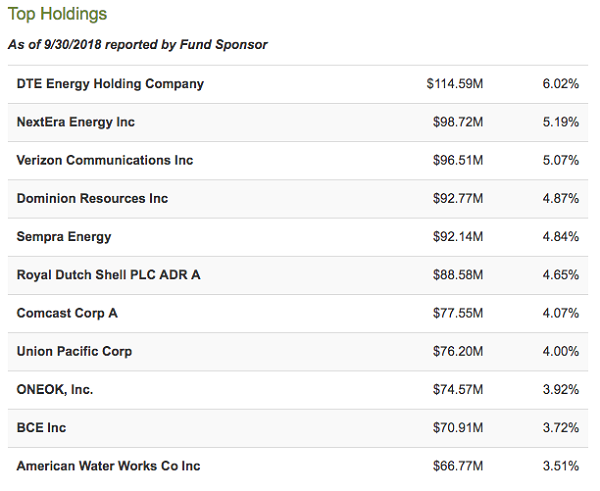 Each of these holdings is a cash cow that will keep dishing money to investors regardless of Washington politics. UTG pays a gaudy 6.5% today, pays dividends monthly and recently boosted its payout, too. The time make a move is now, while you can still get UTG for 96 cents on the dollar. 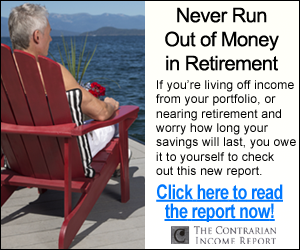 Think You Can’t Retire on Dividends Alone? It’s Easy. Here’s How. If you want income from your portfolio now, the truth is, Raytheon and Northrop won’t help you much. 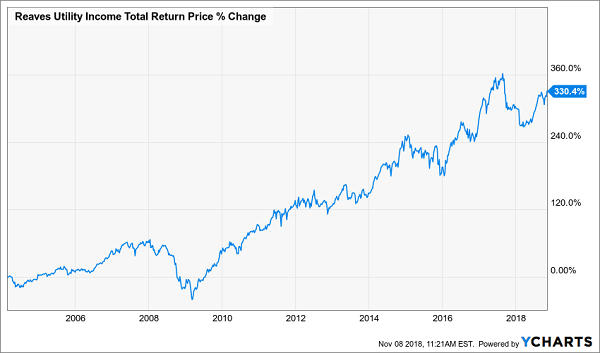 Don’t get me wrong—they’re terrific companies, but you may need to wait 10 years (or more) for the payout on a buy you make today to reach 8% or higher. UTG? It’ll give you a 6.5% dividend now, a more diversified portfolio and payout growth. That makes it a much better deal. But we can go even further. I’m talking an 8% CASH dividend—enough for you to retire on dividends alone with a $500k nest egg. And we won’t have to wait another minute to do it! We can tap this cash deluge right NOW. The key? 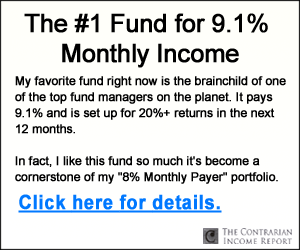 The 6 breakthrough investments in my 8% “No-Withdrawal” Portfolio. As the name suggests, these 6 buys hand you what few other investments can: a safe—and growing—8% dividend. It couldn’t be simpler: just swap out the stale Dividend Aristocrats in your portfolio for these 8%+ cash machines. Imagine what that could mean to you: when you never have to sell a stock to generate cash, you can forget obscure concepts like beta ratings and ignore the markets entirely! Because as long as your income stream is safe, who cares what Mr. Market gets up to on a daily basis? Many folks know this is the way to invest for retirement. They just don’t know where to find the ironclad 8% payers to get themselves there. That stops today, because the answer is just a click away. Go right here to get full details—I’m talking names, tickers, buy-under prices and more—on the 6 rock-steady cash machines in my 8% “No-Withdrawal” retirement portfolio now.